The competition for the best school and the best teacher was summed up with a gala on the 23rd October in the Polish Culture House in Vilnius. The best Polish primary and secondary schools were honoured in the 21st edition of the ranking, which has been organized by the Polish Educationa Society in Lithuania for many years now. This year, the most-awarded schools in the competition have been: Ignacy Kraszewski Gymnasium in Vilnius, Konstanty Parczewski Gymnasium in Nemenčinė, Józef Obrembski Gymnasium in Maišiagala, and Michał Baliński Gymnasium in Jašiūnai. The president of the Polish Educational Society in Lithuania pointed out that the schools have been ranked according to the students` national exams results. This year the criteria has been extended in the way that not only results in the Lithuanian language, foreign language, maths, and history, but also in physics, chemistry, biology, IT, and geography were counted in the overall result of the school. Data concerning university entrances was also taken into account. Today, we are glad but also sad. This sadness is a result of the authority`s certain negligence towards Polish schools in Lithuania – said Józef Kwiatkowski – The gladness is the result of teachers` and administration`s hard work and therefore very good results that we achieve. The president of the Society mentioned that 71.1% of the secondary schools graduates continue their education at higher-education institutions, one-third of whom entered publically financed universities, which is a good result. Representatives of regional departments of education, regional authority, and other eminent guests expressed their deepest congratulations to the awarded schools and their teachers. 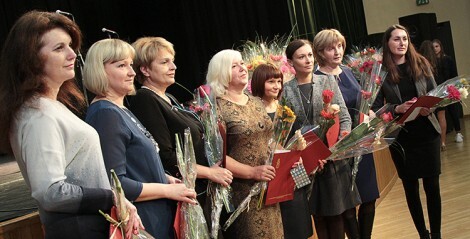 The pedagogues whose students demonstrated great knowledge in the national exams were awarded the best teacher titles. Łukasz Kazimierczak, the Second Secretary of the Consular Department of the Polish Embassy in Vilnius, gave the prizes to the laureates and read out the congratulatory letter from the Ambassador of Poland in Lithuania, Jarosław Czubiński. The ambassador pointed out in the letter that the Polish party is aware of the problems caused by the implementation of the amended Act on Education of 2011, especially in the part concerning the unification of examination in the Lithuanian language. “We realise the difficulties that brings the continually reduced ‘student`s basket’. We perceive the strong competition from well-equipped Lithuanian schools in Polish communities. We are troubled by the setbacks caused by the accreditation procedure” – he wrote. The ambassador mentioned that sympathizing in this difficult situation, Poland is committed to support Polish community abroad, especially concerning national identity, mother tongue, and national culture. “We greatly respect your effort and its effects so important for the young Poles studying in Polish schools, but also for the Polish community as a whole to its continuation and future. I am wholeheartedly thankful and I shall declare my further help. I wish you deep satisfaction in your job and all of your achievements, gratitude of your students, and all the best. I would like to congratulate all of the awarded, and all of the others I would like to wish good luck in the next editions of the competition” – Jarosław Czubiński, the ambassador, expressed his congratulations. In spite of the good results achieved during especially difficult for Polish schooling time, the principal pointed out system flaws of the Lithuanian language teaching. “Introduction of the unified examination in the Lithuanian language led to the student`s concerns whether to choose the school or the national level of the exam. In 2012 only 2% of the students would choose the school level of the exam, whereas currently it is around 10% of the students” – said Helena Juchniewicz, identifying the problem with the metholdology of teaching this subject as soon as at the level of the primary school. “There should be introduced a special methodology of teaching children in Polish primary schools because currently we have the same handbooks and syllabus as our Lithuanian counterparts; the difference is that we have to teach the language at the absolute beginner level. Teachers of the Lithuanian language put lots of effort to puzzle out how to make up for it all. In this case all of the system should be changed. It is claimed that it is being changed but I personally cannot perceive them.” – stated the principal. For the 13. time, the best primary school was awarded in the competition. For its achievements in the schoolyears 2013-2014 and 2014-2015, the Primary School in Pavilnys, celebrating its 100. jubilee, was titled the best primary school. The European Parliament deputy and the leader of Electoral Action of Poles in Lithuania, Waldemar Tomaszewski, expressed his congratulations to the best teachers and principals. “For the time being, we have not been successful in ensuring accreditations for 4 other minority schools. The accreditation for another 2 schools is just a matter of time. We cannot give up.” – pointed out the AWPL leader when mentioning the extension of the deadline for accreditation up to 2017 by the Parliament. “Court decision concerning Konarski School is outrageous. It is claimed that parents should have thought out that there would not be any secondary school grades formed. The Parliament votes for the extension of the deadline for accreditation, so parents should have thought out that the Parliament is voting just for fun?” – added Tomaszewski ironically, calling judiciary a disgrace and commenting on “politicized courts of mates and buddies”. Students, laureates of the Polish Children and Youth Song Festival, kept the audience amused with their performances. The actors of the Polish Theatrical Studio performed a play titled “All that makes up Poland” directed by Lilia Kiejzik.